In the aftermath of the Civil Rights Movement in the 1960s, mainstream comics made an effort to diversify the characters in their rosters. Black Lightning, created in 1977 by Tony Isabella and Trevor Von Eeden, was the Jackie Robinson of DC Comics, if not the DC Universe itself. While his solo title only lasted about a dozen issues, BL went on to become one the major players in the DCU, most recently getting his own Final Crisis-related one-shot, Final Crisis: Submit. As a multiple Olympic gold medalist, Jefferson Pierce could easily have turned his fame into fortune. Instead, he chose to return to his old crime-ridden neighborhood as a high school teacher - and Black Lightning, hero of the streets and protector of ordinary people threatened by criminals and their activities. Since his debut in the 1970s, Black Lightning has been a member of Batman's Outsiders, the Justice League, and even served as Secretary of Education under President Lex Luthor. There was also an ersatz version of Black Lightning on the Super Friends cartoon called Supervolt Black Vulcan (created to avoid having to pay Tony Isabella any royalties). In recent years, there have been additional BL knock-offs introduced on both Static Shock (Soul Power) and Justice League Unlimited (Juice), so he may be the most-adapted character to never appear on any form of adaptation. Black Lightning gets his first Mattel figure as part of the fifth, Wal*Mart-exclusive series of DC Universe Classics, which features a Metallo "Collect-and-Connect" figure. Each of the five figures in the series comes with a piece of Superman's metallic foe; BL comes with his left leg. 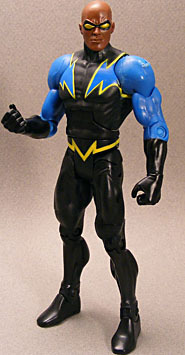 Like The Atom, Black Lightning doesn't feature the most exciting sculpt. He has a basic DCU male body, the same one we've seen on many other characters, and absolutely no details or new tooling other than his head. The head sculpt is well done, but like the Eradicator, something was lost in the transition from prototype to production. 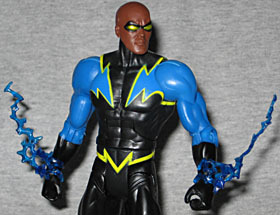 Black Lightning was supposed to have clear yellow goggles that revealed his eyes behind them, but due to the extreme cost-cutting measures on this series, his glasses were molded as part of the head instead. It's not as bad as the Eradicator, since BL's eyes are smaller and less noticeable, but the clear goggles would have been a lot cooler. While the quality control on DC Classics has been scattershot (to put it mildly), my own Black Lightning's paint applications are good. There's little to no smudging, and the thin yellow trim looks great. However, your mileage will undoubtedly vary. Our own yo go re, for instance, got a BL from the same store, with faded and uneven yellow lines, blurred edges and noticable blotches. Definitely check before you buy. Black Lightning has the standard DCU articulation: balljoints at the neck and shoulders, h-hinges at the hips (allowing for balljoint-like motion with less harm to the sculpt), hinges at the elbows, knees, torso and ankles, and swivels at the wrists, biceps, thighs and waist. Like the Atom, what Black Lightning really needs are some accessories. I realize the cost-cutting measures on this series were extreme, but in this case Mattel had a ready-made mold that would have worked perfectly: the blue wrist-electricity from Superman Blue. But alas, you'll either have to borrow Supes's bolts or just imagine BL's electric arcs in your head. While Black Lightning is a great-looking action figure, he's another victim of the extreme cost-cutting on this series, as he lacks an accessory or even his clear goggles. Since it seems likely there will be another Wal*Mart series of DC Classics, it might behoove Mattel to try and throw in a few more accessories or deliberately choose characters for whom there aren't any obvious accessories, like Martian Manhunter or Connor Kent.